The Club Reno slot machine can be played in the online casino of Oranje Casino and can be counted among the category with authentic slot machines. It is therefore a kind of slot machine that in the past could be played in the cafeteria or pub around the corner. Nowadays that is no longer possible, but luckily Oranje Casino offers this possibility in the online casino for fans of the classic slot machines. Club Reno is currently only available in the online casino and this slot machine is not yet available in the mobile casino. What is not, can still come, but until then the online casino can of course be visited to gamble on it for free or for money. The game will proceed in the same way with the only difference that no money can be earned on gambling in practice mode. That is possible if you decide to gamble immediately with money. Before the game starts, you can check whether you want to gamble with the set coin value or play with a different amount. Gambling with a bet of 0.20 euros per spin means that you are playing with 1 point or credit at a time. A club meter is also available and a progressive jackpot linked to other classic slot machines can be won. This slot machine has three reels and three reels are available. By clicking on the start button, the reels will spin. The reels stop automatically and then it is immediately visible whether there is a winning combination or not. The handy thing is that the pay table can be seen on screen, so that you can see which combination of symbols will be the most valuable and which combination of symbols will make you less money. This gives you as a player the opportunity to keep the winnings of a winning combination or to bet for a gambling game. In the gambling game you make the choice between head or coin to double the winnings. That is possible every time a profit is made, but you have to take into account that the profit can also go up in smoke if you have just made the wrong choice. There is another feature available and that is the possibility to role. If you want to fix a role, you use the button that is listed under the relevant role. In the club meter game, more credits are played and more paylines are active, so that the chance of winning naturally increases. 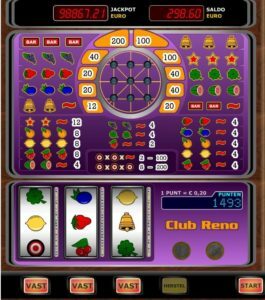 The balance can be moved from the club meter to continue gambling in the basic game of the Club Reno slot game. Incidentally, the jackpot always falls completely randomly and that may be just when you are playing.